The developer for the Kentucky Ridge Subdivisions 3 & 4 has proposed a Pressurized Irrigation System (PUIS) under the operation of the New York Irrigation System. Kentucky Ridge Subdivisions 1 & 2 are split in between the New York Irrigation District (NYID) and the Nampa & Meridian Irrigation District (NMID). Because the pump house for the PUIS system for Kentucky Ridge Subdivisions 3 & 4 will be located in the NYID area, it is proposed to move all the properties in Kentucky Ridge Subdivisions 1 & 2 that are in the NMID, from NMID to NYID. In addition, it is proposed to create a Local Improvement District (LID) to fund the retrofit of a PUIS system in the Kentucky Ridge Subdivisions 1 & 2. This LID will finance the retrofit of the PUIS system over time and allow the Subdivisions 1 & 2 to take advantage of connecting to a proposed PUIS pump house which would reduce the overall cost to those homes. A minimum of 60% of the owners of the homes in the LID area will need to sign an LID form. NYID will create an LID under Idaho Law. 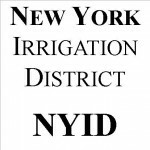 NYID will finance the construction of the main lines servicing all the homes in the LID providing a connection point for each lot. Owners will be responsible for connecting their lawns watering system to the connection point in their yards. The connection points will be near an edge of their property.